The Kendrick K Spot, Kendrick's most popular point to point handwired amp, weighs only 35 lbs. The tone is phenominal. Turn it up and pick light, and you can get that vintage, bell-like, clean tone that can only be gotten with a tube amp. Pick a little harder and you'll hear some hair around the edges. Pick yet harder and she will snarl at you; but lay in to that pick attack and she will break into a controlled feedback sustain. These tones can be easily manipulated with only a difference of how you happen to feel. There will be times when you feel like the amp is reading your mind because after a while it becomes you. I know that seems strange to say, but ask anyone that owns one and be prepared for a sermon. You can have a huge sound, but without having to schlep a big rig to achieve it. 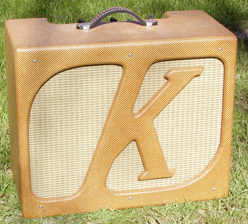 All Kendrick K Spot Combo amplifiers are built with ultra lightweight antique pine and a Kendrick Brownframe speaker! The tone of the K Spot will cut through a mix and hold its own with amplifiers rated for three times the power. So lightweight your girlfriend will want to carry it, yet so big sounding it will compete with a full stack. Cabinet made from 100 year old Northern Pine beams that have been cut and planed into 1"x12" boards. This super-resonant design has the side effect of weighing only slightly more than Balsa wood. "Tone beyond tweed. Notes explode, then unfold with a richness and complexity that's like a fine wine. Its sensitivity to touch is psychic--you'll swear this amp reads your mind. Put it on a chair, anywhere on the stage, and it blows away the entire room!" �I can't use technical terms, but in short, it's the best sounding amplifier I have ever heard, period. It has an organic, three dimensional tonal quality to it that almost requires a special vocabulary to describe, much like a fine aged French wine. It's control panel is simplicity in its elegance. The 100 year-old-box and my choice of aged tweed has people who see and hear it think it's a vintage amp. I own a few 50's tweed Fenders and have access to almost every model made in the 50's and 60's. My new Kendrick sounds as good as the best Bassman ever but is the size of a Deluxe. I have played it every weekend (sometimes four nights a week) for the past year and have not had one problem. I would recommend this amp to anyone who likes that tweed sound but wants it in a small package. If anyone in the Chicagoland area needs to hear one to believe it they are welcome to contact me or to come see my band. I just had the pleasure of using my new Kendrick while jamming with Van Wilks and Scott McGill (the original test pilot) at the Rhythm Room in Houston, doing a simulcast on KPFT. The amp holds it own even with a 50 watt Marshall on the other side of the stage. Afterwards, Scott said he was going to call you to order a new one. I am also using it as my recording amp of choice. It responds well to single coil and humbuckers � just turn it up and play off the volume knob, from crystalline bell tones to a rich crunch with harmonic overtones and controllable feedback, without loss of high end at low volume. Awesome amp in a small package, built like a tank, superb appearance. Thanks for the tone!